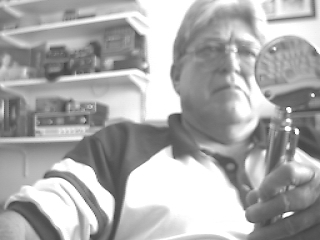 Here is some picture's of me and my stuff,Iam surprized I didnt break the camera.I run a washinton base with a D-104 and a smoking gunn jo gunn antenna.In the mobile I run 148 cobra gtl with a 102 steel whip. 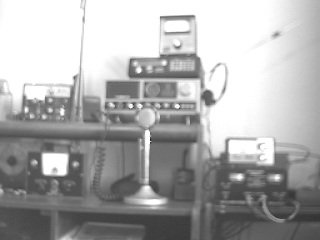 I like talking on the radios,I was in it back in the 70's when it was 23 channel days.I got back into about three year's back and enjoy it alot.If Iam not on the radio Iam on the computer.I would have never thought I would have bought a computer and sit and learn how to use it.If they would have had computers back when I went to school it would have been fun in school. Oh well its nice to play with the big boys toys, I call my radio the little big radio,my friend wizard or operator31 sure helped me out alot, he knows alot about radio's and antenna's and computer's he got me hooked on these computer's. Any how I hang out on 26.915 most of the time or maybe on 27.505 the misfits ssb channel.Just join the misfits 553 that's me. OK 73zzzzzz two you all and hope you all have a good day and we are going to get out of here and hope to talk to you on the band.